In November 2001 Museu da Marioneta relocated at the Convento das Bernardas. It is the first and only Portuguese museum solely dedicated to the interpretation and dissemination of the history of puppets and puppet theatres, featuring the history of this utmost fascinating art throughout the world, the different types of puppets and the various approaches they allow, focusing on the Portuguese puppets. 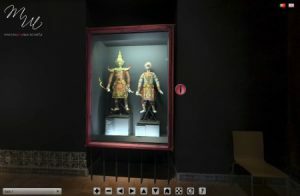 The museum’s collection has evolved progressively, depicting the different theatrical forms that derive from ancient traditions or from modern artistic pursuits, exploring new forms, new materials, and new techniques. This development was possible due to the help and support of various people, authors, collectors and puppeteers who joined us in this project, giving their inestimable contribution and assets. The Museum wishes to acknowledge their outstanding support. In the beginning our focus was put upon the national universe, and we are deeply proud to feature one of the most significant and complete collections of Portuguese traditional puppets. As off end of 2008 we opened our doors to the rest of the world to welcome – as a deposit – the outstanding and wide collection of African and Southeast Asian puppets and masks belonging to the collector Francisco Capelo. Our mission is to implement a whole range of activities related to the collection, maintenance, preservation, research, exhibition ad fruition of puppet theatres, puppets and its history. Our goal is to spread its knowledge and learning, fostering activities in this specific field, conveying knowledge, education, and fun for all those who visit us. The Museum was founded in 1987 by Companhia de Marionetas de S. Lourenço , a travelling theatre company that performed both in Portugal and abroad. It was, thus, the first Portuguese venue dedicated to puppets – since Teatro do Bairro Alto was extinguished in 1755 – and to preserving a theatre and opera Portuguese tradition. The existence of a Portuguese puppet theatre and opera tradition – very significant within the history of European theatre – was represented by the historical repertoire of the puppet operas created by António José da Silva – o Judeu – and by the popular repertoire of several travelling puppet companies that appeared in the whole country throughout the centuries. Thanks to its activity Companhia de São Lourenço, founded by José Alberto Gil, musician, and by Helena Vaz, puppet maker and artist, acquired different kinds of puppets that were the initial core of the Museum’s estate. The building was highly degraded, and the Museum’s private management and lack of financial support and institutional sponsorship prevented its economic feasibility and the maintenance of a project that, throughout 13 years, represented Lisbon in the international puppet circuit. Its outstanding collection and the fact that it was the only museum of its type in Portugal, led to an agreement signed between the owner of the original collection and the Câmara Municipal de Lisboa – represented by municipal company EGEAC – which enabled the preservation of the museum and its relocation to a venue that allows its public fruition within the noble conditions it deserves. The museum is situated in the Convento das Bernardas, listed as being of National Interest , under the designation of Public Interest. King João IV founded Convento das Bernardas in 1653, and its cloister confinement was ready in 1655. The building itself was almost totally destroyed by the 1755 earthquake, and its reconstruction started in 1758 under the supervision of the architect Giacomo Azzolini. In 1786 the nuns return to the convent and live there until 1834, when Religious Orders were extinct and their assets apprehended. The former convent accommodates then various tenants, and in 1850 is purchased by Joaquim Lopes Câmara who uses the premises as a school, high school, movie theatre, show hall, philharmonic headquarters, and finally as home for several families. By then the building was highly damaged. In the end of 1998 the building was acquired by Lisbon’s Town Hall, and its restoration works began in November 1999 and lasted until July 2001. 34 families were then relocated at the former convent in much better housing conditions. Some other establishments were also implemented within the building, such as the neighbourhood club, a restaurant and Museu da Marioneta. This former convent is now a lively and dynamic focal point of one of Lisbon’s most typical areas. Book your tour in advance by letter, fax, email or phone. In order to motivate your pupils, prepare you visit to the Museum along with them. We provide teaching material for teachers and students of all levels to be used after the tours. Do not exceed the number of students recommended per group. Please be on time. Should you have to cancel your visit, please let us know asap. Help us and fill the form giving suggestions. Should you have any doubts, don’t hesitate to contact us! Click on the picture to see the virtual tour.